Clamshell with 3 compartments: Book #1: Wild horses thunder in the libraries. Book #2: 340A: Titles & Authors / 340B: Sentences. Card set: Bookshelves of NYC. Dobbin Mill papers made from catalog cards courtesy of Brooklyn Museum of Art Libraries. 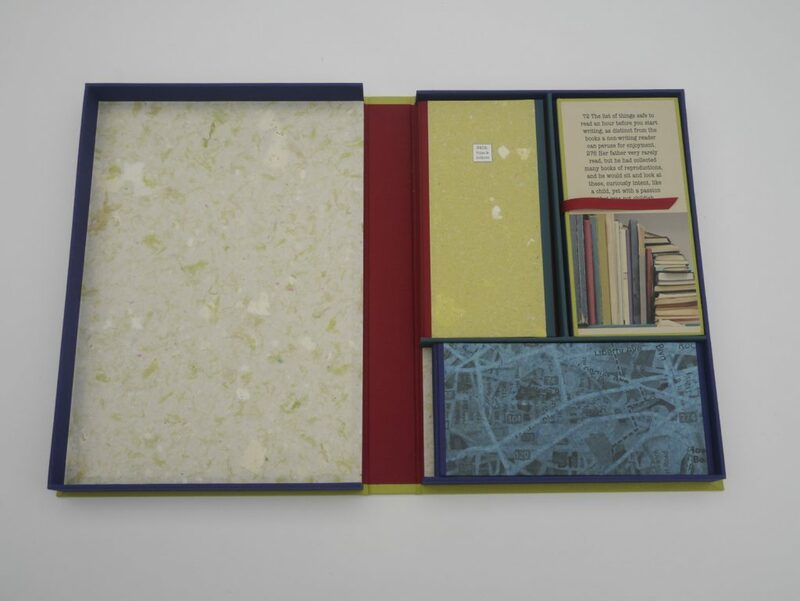 Clamshell with opened books & cards removed from their respective compartments: Wild horses thunder in the libraries is made from a filigree-cut map from National Book Association, with 340 book hot spots (libraries, book stores & literary associations). It was re-folded into a double pamphlet structure. 7 cards lay on the closed clamshell. They present the artist’s photos of favorite book shelves in NYC, along with found texts about books & reading, taken from 340B: Sentences. Dos á dos book, 340A: Titles & Authors / 340B: Sentences, open on top of clamshell cover: a list ordered by page number of 340 book titles & their authors in my personal library fills one side of the dos á dos, while the particular sentences that were found on those pages form the color coded prose text of the other side. Book 1: 8.5″x8″ / Book 2: 4″x25″ / Cards: 4″x8″ ea. Although the basis for my work, whether artist book or installation, is conceptual, much of my artwork stems from an essential materiality. The artwork reflects on both my material sensibility as much as the content and issues that comprise their core. Paper has been my preferred material for over 30 years and I have explored its potential as a non-neutral substrate in my image making, book making and process. An important focus of my artist books is language cognition – what words can actually communicate and their limitations. Can ideas exist without language and words? Or, does word order define meaning? The resulting artworks, whether made as objects or installations, force the viewer to re-consider the very act of ‘reading’. In 2012 I received a map in the mail from the National Book Foundation called Reading Hot Spots in New York City. 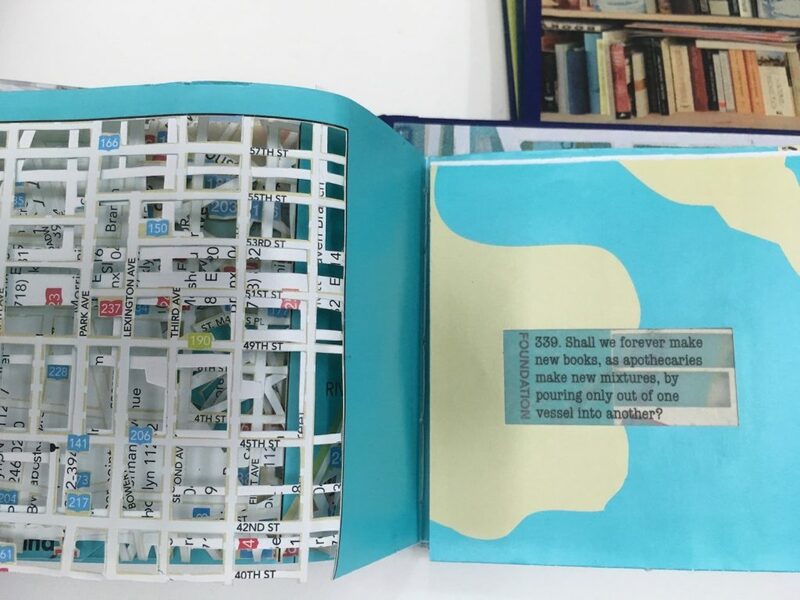 I had recently finished a set of artist books made of maps and I knew that I must do something with this extraordinary find, which evolved into a box set with 2 books and a set of cards. The focus was on book collections, starting with my own. Appropriating a sentence from a selection of 340 books in my personal library, each sentence from another numbered page, I created a text, that was then color-coded and printed in one half of the dos á dos book, 340B: Sentences. In 340A, the titles & authors of these books are listed, along with page numbers where each sentence was found. 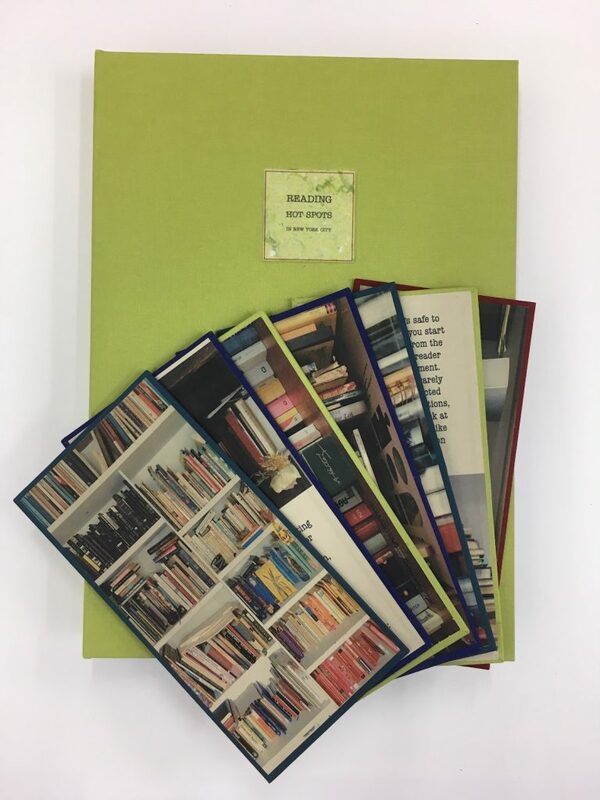 A set of cards are also found in the box, containing those sentences pertaining to books & reading, along with images of some of my favorite bookshelves in New York City (from the Spencer Collection at the NYPL to a Time Square magazine rack). 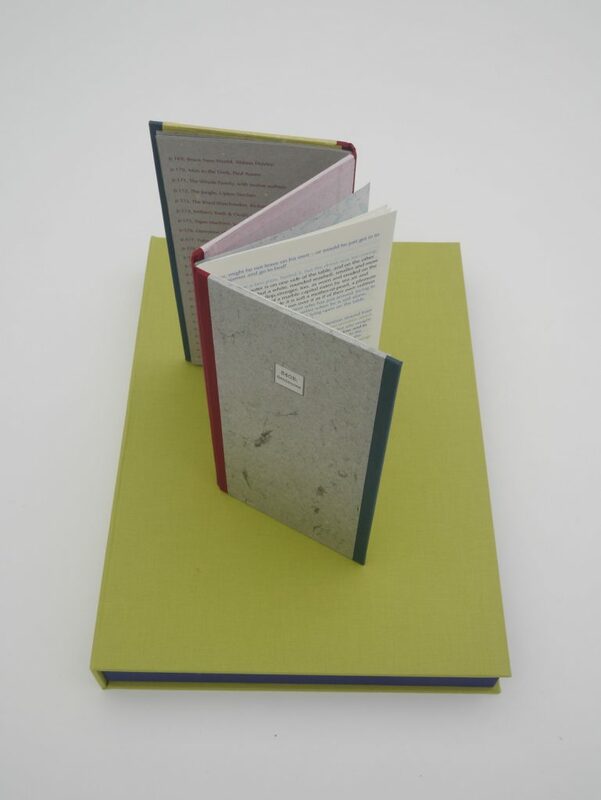 The second book consists of the Reading Hot Spots map that I filigree-cut, re-folded and sewed into a double pamphlet book structure, with a 3rd selection of those sentences to create a shorter playful narrative. 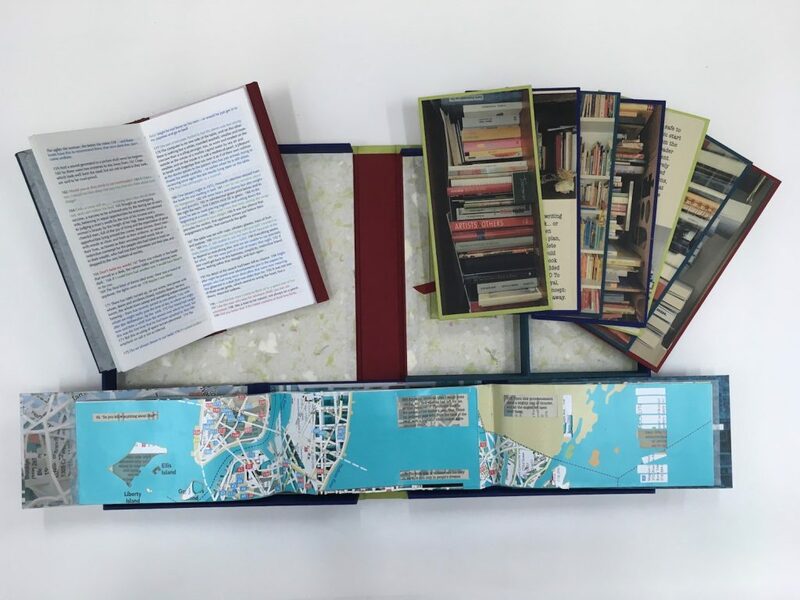 Together, these three components are an homage to my world of books in my beloved New York City.